Doctors say to drink half your body weight in ounces. A 200 lbs person would drink 100 oz of water. AND any increase in consumption is good for your health with hydration and detoxification. Hook it to your tap. First thing in the morning-and all day. One glass before a meal will create a pattern to lose weight.There are multiple uses of the machine to alter the PH of the water for cleaning, disinfecting, toning, cooking…. It’s just water; why is it different? The potential hydrogen(PH) of alkalized water lowers the acidity of the body. Hydration from the smaller water clusters allows the water to enter your cells quicker and easier. The water does not need to sit in your stomach for digestion and there is not a bloated feeling. The anti-oxidant properties of the water increase detoxification; the building of your immune system. What is the difference between alkaline and alkalized water? Alkalized water uses an electrolysis process, not a chemical addition to becoming alkaline. Some companies and bottled water add inorganic mineral such as sodium bicarbonate, calcium, magnesium to create alkaline water. Alkaline water does not have oxidation-reduction properties found in alkalized Kangan water. Alkalized water has the negatively charged hydrogen which acts to grab free radicals in our bodies left from acidic oxidation and an overly acidic diet. Are chemicals added to the water? No! 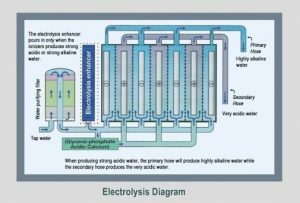 The electrolysis process converts the PH of the water without chemicals. The machine filters 99.9% of pollutants in tap water without any chemical additives. It is pure ionized water like the waters of the Blue Zones, those magical areas of the planet where diseases are at a minimum and longevity thrives. What has the water done for you? Given us a purpose to help people. Health is an issue with everyone and the only way to cut medical costs is to get healthy. I know one person with a medical condition that Kaiser said needed surgery and 3 weeks of drinking the water and the condition was gone. Another who had regular gout attacks and stopped the medicine and has not had an attack. There is a myriad of stories how the water was part of the process to restore hydration, build the immune system to allow the body to do the healing. Does alkalized water make people feel healthier? Yes, most people feel more energy, sleep better, and think better. The increased hydration speeds the detox process. Many diseases result from lack of hydration. Remember the body is 70% water and the brain is 75% water. How can the water help me? The superior hydration by increasing the detox process empowers the immune system. It is the immune system that creates well-being and prevents disease. We ask each new user of the water to fill out our Acidic Checklist to see where they feel their health is so they have a benchmark for the changes the water creates. We also encourage them to write down and move toward their wellness goals. How can I measure the changes in my body? We start you by having you fill out the Acidic Chart as a benchmark of your health concerns. We ask you to drink a half gallon of water daily, stop all carbonated liquids and refer back to the Acidic Chart in 3-4 weeks. The results we have found are weight loss, better sleep patterns, more energy, & seeing the world clearer. Does the machine filter out toxins in the water? Depending on your source of tap water the double carbon filter acts as anti-bacterial removing 99.9% of the chemicals. For some locations, a pre-filter is recommended. How does the water work with cancer? Cancer grows in an acidic environment, by adding alkalized water with oxidation-reduction properties to your system, the negative ions work to minimize our acidic bodies and balance our overly acidic diet. “Water treated by electrolysis to increase its reduction potential is the best solution to the problem of providing a safe source of free electrons to block the oxidation of normal tissue by free oxygen radicals.”-From Killing Cancer Not People By Dr. Robert Wright. How will the water help my diabetes, arthritis, heart condition, etc.? Everyone is different. Water is your body’s most important nutrient, is involved in every bodily function, and makes up 70- 75% of your total body weight. Water helps you to maintain body temperature, metabolize body fat, aids in digestion, lubricates and cushions organs, transports nutrients, and flushes toxins from your body. Using the Kangan water to help the body deal with diseases is supported by hydration, detoxification, and the antioxidation process. We do not make medical claims but do have many stories and doctors statements on the value of the water. Can I drink the water with food? Yes, and it is best to drink 8-10 oz of water before a meal and wait ½ hour after a meal for ideal digestion. Can I drink alcohol with the water? Yes, the hydrating power will stop or cure a hangover. Always drink sensibly, and never drive and drink. Good question. Many bottled waters do not have to comply with FDA restrictions. The water may have been resting in the bottle for months allowing “plastic bleeding”. “Almost all water sold in plastic containers is acidic and was bottled, on average, three years prior to your purchase” quotes Dr. Hidemitsu Hayashi, MD Director, Water Institute of Japan. Bottle water offers no oxidation properties or natural minerals; it is dead water! How long will you allow me to get water at your store? You can test the water for 14 days. We want you to see and feel a difference and to allow you get a handle on your health issues and health goals. Is this an investment in my health? Yes! Water is our best investment and most important nutrient. The medical profession says we should be drinking half our body weight in an ounce to maintain good health. Alkalized water created by electrolysis is our best choice for health, the environment, and our pocketbooks. It is a necessity to all of us because water is the one size that fits all. Less than $.75 a day over the life of the machine. What would you pay for better health, fewer visits to the doctor to deal with symptoms, more clarity and energy? Having a water machine means saving costs on bottled water, and eliminating your guilt over plasticizing the environment. The machine will eliminate many household cleaning items you’ll purchase over the 15 -25 years of life of the machine. How long does the machine last? With recommended care the machine may last 25 years, cutting the cost of having all the water you want for $.47 a day. Can I hook up my machine? Yes, our senior citizen friends watched the YouTube “How to hook up Kangan water machine,” and said it took them less than 15 minutes. We have hooked up many and are happy to help. It depends on your faucet type. Can I get financing to buy a machine? Yes, Enagic has a number of financing plans available. You can choose the plan that is best for you. Is there a guarantee on the machine? There is a 5-year warranty with additional 3-year extensions available. They all require proper maintenance. Who and where are the machines made? All machines are constructed at the Enagic Okinawa factory. Each machine is handmade by one technician who signs his work. This is a unique quality controlled process. The technicians take great pride in their work. Do I have to do maintenance on the machine? Yes, all machines require maintenance. The Kangan water device does self-cleaning and has an easy to replace cleaning cartridge. Factory cleaning is available. Is there residual maintenance costs? Yes, filters do need to be replaced. Filter life depends on how much water you use. Electrolyses enhancer will need replacement to create high alkaline water, the 11.5 Ph and the 2.5 PH acidic water. Does the water have a shelf life?Does it age and get better? Yes, the anti-oxidant properties begin to lose value in 24-36 hours; that is why it is best to drink the water fresh from the machine as the antioxidant properties are greatest. Time, heat and sunlight act to oxidize the ionic properties of the negative hydrogen and lose the alkali and microcluster benefits. How come I haven’t heard about this? We are working on this issue 🙂 Enagic is a 40-year-old company in Japan and began doing business in the USA in 2006. It began in Los Angeles, which is why so many stars have the machine. How many people in the US own a machine? One in 18,000 homes in the US own a machine. Roughly 1.55%. In Japan 1 in 8 families have a machine. The business of health and wealth are great opportunities with Enagic Kangan alkalized water here is the US. Over 40 years in Japan and since 2006 in the USA. Enagic is in 118 countries. What happens if I sell a machine? When you purchase a machine and fill out a W-9 form you become a distributor and are compensated for sales. The compensation structure is unique and very beneficial. Is the water good when I exercise? The water does a great job keeping you hydrated during exercise because of the immediacy of micro-cluster effect of Kangan water. The smaller grouping of water molecules allows the water to begin hydrating immediately upon drinking. This replaces the water used when exercising, aids the detox process, and the waters’ alkalized PH value adds energy. Can I drink the water at my workout? Yes! Before, during and after exercising. One of the benefits of the water from the micro-cluster allows the water to begin hydrating before it reaches the stomach so there is no bloated feeling. Who is drinking this water? Any athletes? From Bill Gates to Steven Tyler, Demi Moore, Kevin Hart, Carlos Santana, Tiger Woods, Phil Mickelson, the LA Lakers, NY Yankees, Anthony Robbins and Beyonce to name a few. Is the water like the water in the Blue Zones? The inspiration for alkalized ionic water came from studying the lifestyle of the Blue Zones areas, Lourdes, Hunza Valley, Ticote, where the naturally occurring water leds t0 to greater disease freedom and longer lives. The science took over 200 years to finally come up with a machine that duplicates Blue Zone water and is compact enough to fit on your counter. Mankind has been chasing a Fountain of Youth for eons. The history of the machine evolves from 1789 when Jan Deiman and Adriaan Peets began attempts to replicate the water from the Blue Zones. It was Michael Faraday who developed the electrolysis process to separate the hydrogen molecules making water ionized. In the 1930’s Nobel Prize winner Dr. Henri Coanda traveled to the Hunza valley and found the frozen water crystal different from normal water and began using Faraday’s electrolysis’ process to form that same crystalline shape as found in the Hunza Valley with much of the same benefits. The Japanese were able to use Dr. Coanda research and refine the machine into what we have available today from Enagic. Hironari Oshiro started Enagic in Osaka Japan 1974, and he is a model of health, fitness and a scratch golfer. Why should I drink Kangen Water®? Kangen Water® provides your body with the useful minerals it needs while offering optimal and maximum hydration. How do I start drinking Kangen Water® in the healthiest way possible? The best way to begin drinking Kangen Water® is to start slowly. Begin with the lowest alkaline level and work your way up to alkalinity levels around 9.5 to 10. Can I use Kangen Water® to take my medication? It is recommended that you consult your doctor before consuming Kangen Water® while taking any medication. If doctor-approved, only purified water should be used to take the medication itself. Can Kangen Water® be used for beauty and skin care? If so, how? As we all know, hydration is an important factor in your skin’s health. Kangen Water® not only gives your body maximum hydration, but can be used to preserve the moisture of your skin. In order to use Kangen Water® directly on your skin, either use a spray bottle to spritz your skin with our specifically designated acidic beauty water throughout the day, or use it to bathe and wash your face. What are the white things floating in my Kangen Water®? Should I be worried? No need to be concerned. The tiny white bits in your Kangen Water® are just mineral clusters and are completely safe for consumption. What causes Kangen Water®’s occasional odor? Kangen Water®’s occasional odor is caused by the minerals in the unpurified water it comes from. This isn’t a sign of anything wrong, and is completely normal. Should I mix my Kangen Water® with alcohol or flavor additives? No, Kangen Water® should not be mixed with alcohol or flavor additives, as it reduces the effects. If you have any other questions about Kangen Water®, please contact us. We’re happy to provide any information you may want.